Last week, U.S. President Barack Obama followed all his predecessors since Harry Truman and officially proclaimed the commemoration of “Captive Nations Week”. Interestingly, based on the original 1959 Congressional resolution, one of the captive nations being commemorated was Tibet. The resolution denounced Communist Russia’s direct or indirect role in the “subjugation of the national independence” of countries including: Poland, Hungary, Lithuania, Ukraine, Estonia, Romania, mainland China, North Korea, and Tibet. While clearly understood through the lens of anti-communism, this resolution also expressed powerful moral support for the aspirations of these captive nations. It also showed that the U.S. Congress considered Tibet to be separate from China. 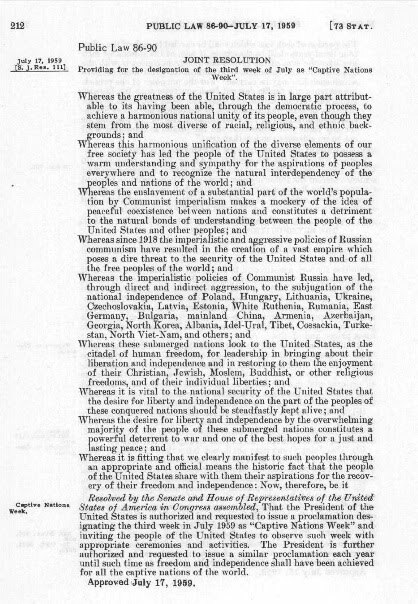 Even more, the resolution linked the “desire for liberty and independence” to the cause of peace. It declared that the fulfilment of these goals is a “powerful deterrent to war and one of the best hopes for a just and lasting peace. Clearly President Obama’s declaration has no more than symbolic significance for Tibet, and even that comes largely indirectly through the original Congressional resolution that mentioned Tibet. U.S. policy does not change based on this declaration. However, the continued commemoration of the subject of the original 1959 resolution does deserve attention. In addition to its historical significance, it illustrates some of the enduring principles, arguments, and ideals that continue to have resonance for any captive nations still seeking their freedom.